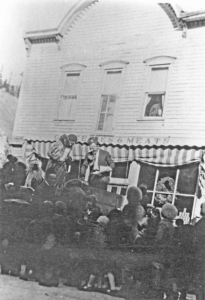 Santa Claus stopped in Red Cliff, Colorado on Christmas Eve, 1935, delivering bags of fruit, nuts and candy to each child, and promising to return later that night. The American Legion and Auxiliary, Battle Mountain Post No. 47 hosted Santa’s visit. He stopped at Clooney’s Store to greet the locals, and posed for a photo with his hosts. The Eagle County Historical Society wishes you a Merry Christmas and hopes that Santa stops by your house, too! https://eaglecountyhistoricalsociety.com/wp-content/uploads/2018/12/WEB-Santa-at-American-Legion.jpg 1695 2781 Jaci Spuhler https://eaglecountyhistoricalsociety.com/wp-content/uploads/2018/02/Eagle-County-Historical-Society-logo-2018.png Jaci Spuhler2018-12-15 18:20:102018-12-15 18:20:10Happy Holidays!